The wide receiver position is regarded as one of the hardest to transition from college to the pros. Not many rookies come in and immediately set the world on fire. In most cases, receivers take two or three seasons to get the hang of playing in the NFL. The jump in competition, as well as the need to develop as route runners, holds off their immediate impact. Cordarrelle Patterson was no exception. Patterson only spent one season in a major college program after transferring to The University of Tennessee. Most regarded him as a very raw prospect who would need time. He is a physical marvel, but was very unrefined. The Minnesota Vikings took him in the first round, but seemed to agree with that assessment. The Vikings coaches did not have many snaps or specific plays for Cordarrelle Patterson early last season. His lack of prowess as a route runner really seemed to hold the team back. With an unstable quarterback situation, it was even harder to find ways to get Patterson the ball. This caused me to amend the Reception Perception methodology to only include games with 20 or more snaps. The good news is that the rookie seemed to develop very nicely towards the end of his inaugural season. The Vikings began to throw him out there him more often, and Patterson just kept making plays. Through the eyes of Reception Perception, we can learn much more about Patterson. You can watch him for a second and see he’s a true physical specimen. The question is whether he showed signs to indicate he’ll be a great NFL receiver. Let’s find out. This was the only game from the first half of the season that qualified for Reception Perception’s snap minimum. The Vikings and Browns squared off in surprisingly entertaining slugfest. Cordarrelle Patterson only recorded two catches during the contest. He did, however, show some nice things. Admittedly, it’s quite hard to glean much from this game’s route tree. With Patterson only running 11 routes on the day, the sample size is just too small. One factor to note is that the Vikings did not ask Patterson to run any dig or out routes. This was likely due to his inefficiency and mastery of route running. Throughout his rookie season, Patterson spent a large amount of time rounding off his routes. Outs and digs require quick, sharp cuts to create separation. It made sense for the Vikings to pass on those patterns for their rookie receiver. The lack of sharp in and out breaking routes is interesting from this chart. It’s a factor that’s worth monitoring for the rest of Patterson’s season. Again, it’s hard to gather many deep conclusions based on Patterson’s low route total. Yet, his work against coverage shows how early on he was in his development. Patterson faced man coverage nine times against Cleveland. He only freed himself from the defender 33.3% of the time. Patterson played most of his snaps as an outside receiver. Out there, he struggled to free himself from very good corners like Joe Haden and Buster Skrine. The rookie didn’t posses anything close to the advanced technique needed to beat players like that. Here Patterson runs a vertical route down the sideline. Christian Ponder underthrows the ball, so the receiver must adjust. Patterson tracks the ball well over his shoulder, and works back for a fantastic catch. He does all of this mid-air and in a highly contested, tight coverage situation. Such ball skills, and fearlessness in coverage are skills that are tough to teach. Patterson is regarded as a raw player, but he also has these sorts of traits down pat. Even early in his rookie season, Patterson was showing some very encouraging signs. By the time week nine rolled around, the Vikings were staring at a 1-6 record. It was clear they wouldn’t be returning to the post season in 2013. Amidst a lost year, the Vikings finally began to give Cordarrelle Patterson a little more work. As to be expected, that produced some mixed results. At this point the Vikings were still working out how they wanted to deploy Patterson. They had him run more routes than ever before, with 20 total calls. Yet, his utilization was still a bit odd. The route chart can explain Patterson’s strikingly low 4.3 yards per catch figure. 30% of his called routes were on screen and slants. Another 20% came on curls. Patterns such as the screen and slant can present opportunities for yards after the catch. But if the defense is prepared, they are a 50-50 proposition at best. It seemed Dallas expected to see such routes from this rookie. It’s early yet. That must have been what Minnesota thought as they watched Patterson’s film from this game. On Patterson’s 20 routes from week nine, he faced both man and zone coverage 10 times. He did not excel against either variety. Patterson posted a failing success rate of 40% against man coverage. He was slightly better with a 50% success rate when facing zone coverage. Its clear that at this point in the 2013 season, the Vikings were still trying to figure out Patterson. At the same time, the exciting rookie was still trying to figure out the NFL. When the Vikings matched up with the mighty Seattle Seahawks, it wasn’t much of a contest. Minnesota lost the game 41-20. Things got so out of hand that Seattle backup quarterback, Tavaris Jackson, was taking snaps in the third quarter. Cordarrelle Patterson didn’t do much to change the outcome. He only recorded three receptions. Yet, as always, Reception Perception gives an inside glimpse to some helpful clues. Patterson presents a very balanced week 11 route chart. He did not run a single pattern more than 25% of the time. It’s clear that the Vikings’ trust in Patterson is growing at this point of the season. He began learning the route tree, and they were letting him try his hand at more. The most prevalent route Patterson ran in week 11 was the curl. The Seahawks are known for jamming receivers at the line, and sticking to them tightly down the sideline. The Vikings may have assigned their rookie receiver this route to combat that. On curl routes, Patterson was able to quickly break off his sideline routes and face the quarterback. There were several occasions where, under this method, he presented a viable target in the passing game. He didn’t always win, but the young receiver did beat even Richard Sherman with curls and comebacks a few times. With the game out of reach early, Patterson got plenty of reps. He played 45 offensive snaps and was targeted on 34.6% of his routes run. The trouble was that Patterson was clearly still learning on the fly. While he was targeted repeatedly (nine times) he only converted them into catches on 11.5% of his routes. The 2013 Seahawks had a phenomenal stable of corners. The unit clearly gave Patterson fits in man coverage as he failed to get open on 52.4% of his 21 attempts. On the positive end of the spectrum, Patterson began to show off some nice work against zones. Seattle usually plays a cover-three scheme when they aren’t in press man coverage. Patterson was terrific against this package, with a 71.4% success rate. Patterson (top left) streaks toward the end zone looking to score in the face of an insurmountable deficit. He looks to be heading inward, but breaks to the corner late in the route. The issue here is that the rookie fails to feel out where the cornerback is on the play. He doesn’t register the defenders’ position at his back, and he gets covered with ease. Patterson’s lack of awareness on this coverage player presented a problem. His inexperience causes him to lose the defender in his route, and ultimately the battle. Here Patterson (bottom right) runs a post route that finds him in the back of the end zone. He takes his time to reach the stem. While this seems like a curious decision, Patterson has a smart motive. He waits for the corner—who is in zone coverage—to drop down on the flat route. At that very moment, Patterson breaks inside on the post. In that critical juncture, the rookie is wide open for a touchdown. You can see he is visibly upset when Matt Cassel floats the pass over his head. Reading corners and diagnosing coverage is a skill that Patterson begins to develop from here on out. In a lost game, the Vikings’ third first rounder showed them a trait he looks to turn into a trend. The Bears and Vikings met for the second time of the season, and provided a thriller. The two rivals took each other into overtime in Minnesota. While there were plenty of exciting moments, Cordarrelle Patterson didn’t provide many in the passing game. Let’s examine whether his recording a single catch was a reflection of his poor work, or not. Something sticks out right away. Cordarrelle Patterson ran a post on 41.2% of his 34 routes in week 13. While this will obviously be the high watermark of the season, this is the start of a trend. Because Patterson is an unrefined route runner, it made sense to dial up post routes. We saw that Jordy Nelson is an elite post route runner, due to his quick and sharp breaks. Such advanced traits are not skills of the young Vikings’ receiver. Patterson is able to get open on post routes, even though he doesn’t run them with crispness. Instead, his agility and natural gifts grant him separation even when he rounds routes off. This method produced some encouraging results. His stat line is very meager. Additionally, week 13 was Cordarrelle Patterson’s lowest graded day as a pass catcher, per Pro Football Focus (subscription required). Interestingly enough, the Reception Perception process seems to disagree with both basic stats and advanced metrics. Patterson was surely dinged by PFF for a low catch percentage, including a drop. While that is more than fair, a -2.4 grade seems harsh, according to Reception Perception numbers. You could argue that this was Patterson’s best showing of his young career thus far. For the first time, Cordarrelle Patterson maintained positive success rates against man and zone coverage. He also faced both brands of defense a near equal amount in this game. Patterson continued his success from week 11 in beating zones at a 66.7% success rate. He took his first positive step in defeating man coverage by positing a 53.3% success rate. Patterson didn’t actually receive his first target in the passing game until the third quarter. It seems rather curious he was ignored, despite being open more often than not. There are some who believe that Cordarrelle Patterson could have been an All-Pro running back. Had he been developed at that position, of course. Plays like this give credence to that thought. As an open field runner, there might not be a more dangerous threat than Patterson. He is 220 pounds, but moves in such a fleet-footed manner. He has unreal speed for someone his size, with incredible balance at that high pace. Reception Perception does not chart these plays, but there’s no denying their value. We all remember watching the wild snow ridden one o’clock games from week 14 of last season. There were several entertaining, back and forth matches. The Ravens’ dual with the Vikings was one of them. Through all the snow, Cordarrelle Patterson amassed what was easily his best statistical game. Much like in week 13, the week 14 rendition of Patterson’s route chart begins to paint a new picture. The rookie wideout is running most of his routes towards the middle of the field. Post routes continue to be a staple, as 33.3% of the routes were of that variety. Patterson amassed most of his 141 yards after the catch. This makes sense when you consider the routes he ran. Screens and in-breaking routes provide ample opportunities for YAC. With Patterson’s elite open field ability, it only makes sense for the Vikings to use him as such. Much like the route chart, this set of data tells a fascinating story around the campfire. We already know that Cordarrelle Patterson stuffed the stat sheet in week 14. Yet, his success rate vs. man coverage (46.7%) was poor, and zones (66.7%) rather typical. He wasn’t beating the man across from him on a regular basis. Instead Patterson succeeded by making the most of his opportunities. On 27 routes run in week 14, Patterson was targeted on 25.9% of them. The season was moving along, and Minnesota began to feature Patterson more often. He was repaying them for their confidence. Patterson made good on 71.4% of his targets, and made a catch on 18.5% of his routes. Patterson runs a corner route to the sideline from the right slot receiver position. On this play he is matched up with Lardarius Webb, who is an elite NFL corner. As far as polish and technique go, the young pass catcher is no match for this veteran defender. During the route, Patterson allows Webb to get between him and the ball. He doesn’t present a reasonable target for his quarterback. Nevertheless, the ball comes his direction anyways. Even though Patterson is pretty much blanketed, he still hauls in the reception. Ball skills and adjustments at the catch point are some of Patterson’s greatest gifts. It’s hard to top his ability as an open field runner, but these skills sure come close. If there is an attribute that will open up his game in 2014, it’s his deep ball skills. Patterson is on the cusp of being one of those receivers you can just chuck it near and know he’ll come down with it. At this time of the season, the Eagles were marching toward a postseason berth. Common knowledge said they would dispose of the Vikings with relative ease. Football doesn’t always go as planned. Minnesota moved right on past Philly by a score of 48-30. Cordarrelle Patterson continued to show growth in this win by touching the ball seven times. The first rounder produced another very balanced route chart in week 15. The out route was the pattern most often run at 16.7%. One interesting figure that stands out is the 8.3% of routes classified as “other”. For Patterson, most of these “other” routes were option, improvisational or off-script routes. Patterson gets wide open on the top left portion of the screen because he feels out the location of defenders. His quarterback just comes under too much duress to ever find him. For such an inexperienced player, Patterson plays with a good amount of intelligence. The Vikings would be wise to hone his ability to read coverage during this offseason training camp. The data continues to support the assertion that Minnesota was working hard to get Patterson involved. They were moving him around. He never spent more than 40% of his snaps at one receiver position, and even lined up in the backfield 11.4% of the time. The Vikings were inching ever closer to the “just find ways to get the ball in his hands” territory. Progress was the theme for Cordarrelle Patterson to close out the 2013 season. Setback was the theme of his week 16 game. The rookie wideout played 31 snaps and barely made an impact as a pass catcher. He did pop off a rushing touchdown, but only totaled a 2.7 yards per catch average. An afternoon like this showed that there is still plenty of work left to do. If critics wanted to point to a simple route tree for Cordarrelle Patterson, they need look no further. He ran 21 total routes, and the overwhelming majority were simple patterns. Minnesota mostly assigned slants, screens and go routes for Patterson in week 16. In all honesty, this resembled his early season work. Again, it’s clear this was a very poor game. Patterson’s low success rate vs. man coverage (33.3%) and drop percentage of 29% both jump off the sheet. Patterson’s week 16 game reminds us that as he learns the potential for duds always exists. This was one of those, but what matters is whether he learned from it or not. It’s no superstar effort, but these numbers are definitely better than Patterson previous week’s finish. Another rushing score also complimented his receiving touchdown. Patterson played a big role in the Vikings’ season ending win over the Lions. 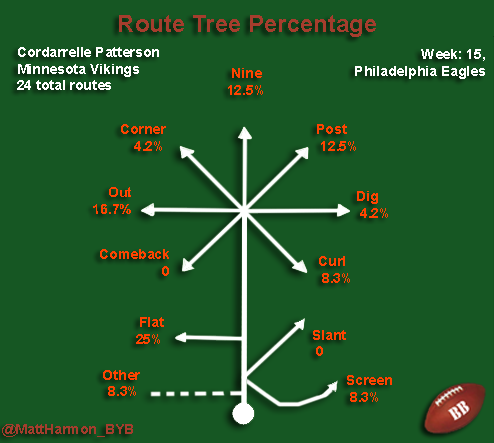 Perhaps it is no coincidence that Patterson had more of an impact in this game given his route percentages. The post route returned to prominence with a 20% figure, after dropping to 4.8% in week 16. Patterson demonstrated to his team that he could execute these types of patterns with proficiency. It’s up to the Vikings to recognize that from the tape, and dial them up during the 2014 season. While it wasn’t a stat sheet stuffer, could week 17 have been Patterson’s true best game? Reception Perception makes a strong case that it was. Patterson returned from a week 16 stinker to post very good success rates vs. coverage. The Lions could not cover him effectively in man or zone, nor jam him at the line. The only trouble was that his quarterback once again struggled to find him. Despite Patterson being open most of the time, he only caught a pass on 5% of his routes. Hopefully with Teddy Bridgewater soon to take over the starting quarterback spot, these days will settle into the rearview mirror. His final receiving score was a summation of all his best skills in year one. Patterson runs a near flawless end zone route, and showcases his elite quick movements. He also demonstrates his quiet but deadly ball skills. Lastly, he reminds us that he’s an excellent player in tight, physical coverage. This isn’t a player who backs down from a challenge. Cordarrelle Patterson did not have a perfect rookie season. But there might not be a more gifted young receiver in the game today. He took some time getting on the field, but when he did he made an impact. Just as he surprised SEC teams with his skills in his one year at Tennessee, NFL defenders were likely taken off guard with his ability. The key for the Vikings being able to work Patterson onto the field was having a plan. And sampling just what it was he could do well. If you were to pass out surveys, would anyone guess that the post route was the route run most frequently by Patterson? It’s likely that many would mark down the screen, but that checked in at a rather paltry 8.7%. The screen routes did go up as the season went along, just over 14% in both week 14 and 16. The “other” routes were also prevalent late in the year. Yet, Patterson’s route tree chart resembles a pro receiver much more than some would guess. Of course you must remember the Vikings’ receiver isn’t running all of these routes like a pro just yet. But the post and curl routes being so highly represented does dispel some of the myth about his utilization. Cordarrelle Patterson did not just run go, slant and screen routes all day. He was developing into a true NFL receiver. This compilation of numbers pales in comparison to the previous Jordy Nelson study. It does however look pretty solid considering the subject was a very raw rookie receiver. Patterson gained experience lining up all over the field. He did finally seem to settle into a home on the left side, and on the line of scrimmage. This makes sense. Patterson profiles as a true X-receiver, while Greg Jennings can efficiently play the role of a Z at this stage of his career. The success rate vs. man coverage falls mostly on the failing side, with Patterson being blanketed on 50.5% of attempts. On the other hand, he did show nicely against zones with a solid 69.6% success rate. Even though it was a limited sample—same with his press numbers—it’s an encouraging sign. Some receivers struggle beating advanced zone schemes during the NFL transition. Patterson did not fall into that group. Just as his ball skills in traffic are underrated, so is his intelligence as a player. Due to his inexperience, some might assume Patterson lacks awareness or is mistake prone. This could not be further from reality. Patterson read, felt out and diagnosed coverage pretty well for a rookie receiver. There are even reports from minicamp that he continues to progress in this regard. Given his youth and inexperience, he graded out quite well under the Reception Perception microscope. It truly is just reps and his inefficiency as a route runner that is holding Patterson back right now. More playing time should remedy his issues. Even if he just becomes an average route runner, his potential is still quite frightening. Cordarrelle Patterson could stumble in his development, but the tape, numbers and data evidence so far doesn’t support that. There’s no reason to believe that Patterson can’t become the next dominant wide receiver in the NFL. Perhaps it doesn’t happen in year two, but it is coming. Teddy Bridgewater and Norv Turner’s presence in Minnesota should only increase Patterson’s opportunity for growth. He is one of the most gifted athletes playing the position, and Reception Perception showed us a developing receiver. Cordarrelle Patterson looks ready to make a jump to greatness at some point. Even if the trip takes time, he’ll certainly make sure the journey is an exciting one. Admin note: We now have an established veteran and an emerging youngster featured on Reception Perception. Perhaps it’s time to find a player somewhere in the middle ground to look at. Tell me who that is by casting your vote for the next featured Reception Perception receiver on the series’ homepage. Maybe I’ll take it into account.